This document is intended to give the reader some understanding of Sanskrit terms and text, primarily relating to Buddhism. It is incomplete and just a collection of notes at the moment. You may wonder why Sanskrit and not Pali, since it is the language for the Theravada Canon. Sanskrit was the main language for religious, literary, and academic use throughout Indian history and it is significant that the Mahayana texts were primarily written in Sanskrit. What are the strange looking diacritics found on Romanizations of Sanksrit terms? I will describe the Sanskrit alphabet, use of the diacritics in the International Alphabet for Sanskrit Transliteration (IAST), and introduce some tools to decipher them. How can I search for Sanskrit words if I don't know the diacritics? This is a more difficult question because Internet and dictionary search tools may not work but having some knowledge of IAST can help. What are the Indic scripts used to write Sanskrit and how can I read them? I will describe the Devanāgarī writing system for Sanskrit and introduce analysis and transliteration tools. Why are some Sanskrit words so long? Long compound words are a characteristic of Sanskrit words and there number of combinations is not fixed. Tools are important to break them apart for deciphering them meaning. Why are there some many different forms for the same word? Sanskrit is more phonetic than English and subtle changes are spelled out with rules called Sandhi. These are listed below in tabular form. In addition, there are many more forms of inflection of words and Sanskrit grammar is more complex than English. I will give a brief outline of Sanskrit grammar and provide pointers to tools. One of the challenges in learning Sanskrit is recognizing the letters, which can be especially difficult with the many diacritics that are used with Devanāgarī. Many people are also not familiar with International Alphabet for Sanskrit Transliteration (IAST) and International Phonetic Alphabet (IPA) symbols. If you find any characters, including Devanāgarī, IAST, or IPA, that you do not recognize then you can use the Character Lookup Tool in multiple character mode to list the individual letters. Select the Multiple characters radio button, enter the Devagari text into the text field, and click the Search button to list the individual letters. In addition, you can mouse over many of the Devanāgarī, IPA, and Chinese text in the document to find out what they are. Mousing over will give basic information and clicking will give more details. The Sanksrit - Chinese - English Dictionary gives a three way translation for a limited set of Sanksrit words. We will see below in the Sanskrit grammar that Sanskrit words are subject to changes based on their grammtical function. These rules can be more complex than English. For example, the letters ḥ or ṃ are added to Sanskrit nouns depending on whether they are used as subject (nominative case) or object (accusative case). These changes in word morphology may not be listed in dictionaries, which usually on list the reference form. The section Sanskrit grammar will give some to help using online dictionaries. I have found one of the most useful IAST-Devanāgarī-IAST Converter. See the References section for a pointer to this and other tools. It is informative to give some background on Sanskrit to save the reader from doing his or her own independent study to be able to understand the content of the document. Since English is more closely related to Sanskrit than it is to Chinese and English words for Buddhist concepts, it is important to make direct use of Sanskrit terms, which can be much more meaningful to English readers than Chinese. Sanskrit is one of the oldest Indo-European languages. It belongs to the Indo-Iranian branch of languages of the Indo-European family. A precursor language to Sanskrit was brought to India by the Aryans sometime after the decline of the Indus Valley Civilization (3300–1300 BCE). The English word Sanskrit (Chinese: 梵語) is derived from the word संस्कृतम् Saṃskṛtam, literally meaning 'refined speech.' The English word 'Aryan' (Chinese: 雅利安人) is derived from the Sanskrit आर्य ārya, meaning 'noble.' The table below comparing names for several numbers in different languages shows the relationship of some core words shared by Indo-European languages. There are many changes that languages undergo over time but there is a fundamental genetic relation between English and Sanskrit that is apparent from core words in the languages, as the table above shows. Systematic phonetic transformations and splitting of language groups are studied by linguists to explain the evolution of languages and give interesting insights cultures and the exchange of ideas between cultures. Sanksrit is from an early branch that split off from a Proto-Indo-Europan language and English is based on a proto-Germanic language also derived from this Proto-Indo-Europan language (Baker and Hengeveld, 2012, chaper 17). Ancient Greek is a comparatively close relative of Sanskrit. This can be seen by comparing the words for five: penta (Greek) and pañca (Sanskrit). Other examples are mother - mātár (Vedic Sanksrit), mḗtēr (Greek); and brother - bhrā́tar (Vedic Sanksrit), phrā́tēr (Greek). The lineage of English is Proto-Indo-Europan, Germanic, West Germanic, Old English, Middle English, and finally Modern English [Shay 2008]. Chinese is a member of a completely different language family, Sino-Tibetan. It can be seen from the table above that the Chinese words for three, four, and five are not related to the other entries in the table. Some changes in over time can be explained by consonant shift and can help us predict some similarities between Sanskrit and English. Grimm's law describes a shift in consonants from Proto-Indo-European to Germanic, also known as Old German. The table below lists these [Shay 2008]. Sanskrit can be divided into three periods: Old or Vedic, Middle or Classical, and Modern. Old Sanskrit dates back to about 1500 BCE. The earliest Sanskrit text is the Rigveda (Devanāgarī: ऋग्वेद ; IAST: ṛgveda ; Chinese: 梨俱吠陀), which contains a collection of hymns, dates to this time. The Vedas were transmitted orally and only written down in text much later. Classical Sanskrit diverges from Vedic Sanskrit when it diverged from spoken language evolving into a language for religious and scholarly purposes. Classical Sanskrit is defined by a text written by Panini (Devanāgarī: पाणिनि ; IAST: pāṇini ; Chinese: 波你尼) describing the grammar of the language in the 4th century BCE. Panini's text is called Ashtadhyayi (Devanāgarī: अष्टाध्यायी ; IAST: Aṣṭādhyāyī ; Chinese: 八篇書), literally meaning 'eight chapters.' In this respect, there are some parallels between Sanskrit and literary Chinese, in that literary Chinese continued use in literature long after it diverged from spoken Chinese and is still common today. Spoken Indian languages are often called Prakrit. Buddhist sutras were originally recited in one or more Prakrit languages and then later written in Sanskrit and Pali. Pāḷi (Chinese: 巴利文) is a Prakrit language from the Middle Indo-Aryan language family and is the language that the Theravada Buddhist Canon is preserved in. It was only several hundred years after the time of the Buddha that the sutras and other Buddhist literature was written in Sanskrit. Asvaghosa (Devanāgarī: अश्वघोषः ; IAST: Aśvaghoṣa ; Chinese: 馬鳴) was one of the first Buddhist writers to use Sanskrit. He was very influential in Buddhism, especially in Mahayana Buddhism, and also in classical Sanskrit literature in general. The early origins of Mahayana Buddhist text and how they came to be written down in Sanskrit is still largely a mystery [Williams 2009] but they gave rise to a voluminous collection of Mahayana literature. The Korean Tripitaka is composed of over 50 million characters. By comparison, the total number of suriving texts written in Old English is only 400 manuscripts [Shay 2008], all written near the end of the First Millenium. Modern Indo-Aryan languages include Hindi, Urdu, Bengali, Nepali, and Kashmiri. They are closely related to Sanskrit. The Buddha was born as Siddhartha Gautama and lived circa 566 to 486 BCE. These dates estimated in relation to the Mayuran king Ashoka (Devanāgarī: अशोकः, IAST: aśoka, Chinese: 阿育王). The life of the Buddha is described in several sources, including the Mahāvastu, Lalitavistara, and Buddhacarita. There was cultural exchange between India and China in both directions: Chinese Buddhists travelled to India and Indian monks travelled to China. In addtion, the Silk Road and many kingdoms along it were important in the transmission of Buddhism to China. Translators of the classic texts came from each of these areas and these translators are still used in modern times in Chinese Buddhism. Most texts begin with a statement about the identity of the translator. The first sutra to be translated to Chinese was the Sutra of Forty-Two Sections (Chinese: 佛說四十二章經) by the Monks Kasyapamatanga and Dharmaratna, who arrived in Luoyang, the capital of the Eastern Han in 63 CE. Some of the most prolific translators of Buddhist texts include Kumarajiva (Chinese: 鳩摩羅什) from India and Xuanzang (Chinese: 玄奘) from the Luoyang area in China. Some were from areas along the Silk Road, including An Shi Gao (Chinese: 安世高) from Parthia; Lokaksema (Chinese: 支婁迦讖), Zhi Yao (Chinese: 支曜), Zhi Qian (Chinese: 支谦), and Jnanagupta (Chinese: 阇那崛多) from Gandhara; Kang Seng Hiu (Chinese: 康僧会) from Sogdia, and Dharmaraksa (Chinese: 竺法護) from Dunhuang. Yi Jing (Chinese: 義淨) from China, rather than travelling over the Silk Road, travelled to India by sea stopping in Srivijaya in present-day Indonesia, which was a major Buddhist center at the time, translating texts to Chinese. Many ethnic groups along the Silk Road, such as the Yuezhi (Chinese: 月氏), located in areas in present-day Afganistan and Xinjiang, China, and Sogdian (Chinese: 粟特). located in areas in present-day Iran, and the Xianbei (Chinese: 鮮卑) located in present-day Mongolia and the Chinese central plains, besides producing translators, were important for the transmission of Budhism to China by means of their strong beliefs. These peoples used other languages in addition to Sanskrit. The wide geographic range of people and places involved in translating Buddhist texts indicates the extensive influence of Buddhism, Sanskrit, and Indian culture throughout Asia in the first millenium. Bodhidharma (Chinese: 菩提达摩), who travelled to China from India in the 6th century, is known as the patriarch of the Chan (also known as Zen) school in China, which is one of the largest schools of Buddhism today. We know of this cultural exchange between China, India, and other neighboring areas through the classic texts Fa Xian's A Record of Buddhist Kingdoms (4th century), The Record of the Buddhist Monasteries of Luoyang (6th century), Xuan Zang's Record of the Western Regions (7th century), others. 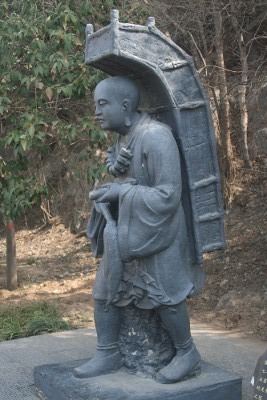 The picture below shows a statue of Xuanzang returning to China from India with the scriptures from the city of Luoyang. The earliest Buddhist scriptures that were brought to China were written Sanskrit in the first century (Shen 2009). In the early stages of translation some scriptures were translated based on oral recitation by travelling monks. In addition, some scriptures were translated to Chinese from Prakrit languages or the languages of ethnic groups along the Silk Road. Given the circumstances and the difficulty of translating Sanskrit into Chinese the different Chinese translations are incredibly similar. Sanskrit had a strong influence on the Chinese language after its introduction to China with Buddhist scriptures. It led to the use of fanqie ryhming style to indicate the pronunciation of Chinese characters. It influenced Chinese literary style, leading more use of metaphors, and a style more closely resembling everyday speech. The scriptures and related Buddhist stories also gave rise to Chinese folk literature, such as Xiang Mo Bian Wen. It is estimated that approximately 30,000 Sanskrit words were introduced into Chinese, all connected with Buddhism (Shen 2009). Many of the manuscripts providing us with this knowledge come from Dunhuang, an oasis town in the dessert and ancient cross-roads between East and West. 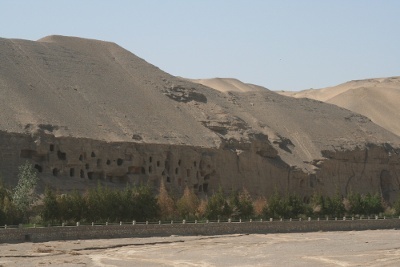 The Library Cave at Mogao Caves (Chinese: 莫高窟) is a major archeological discovery of historic texts written in Chinese, Sanskrit, and other languages. Most of the texts relate to Buddhism. Sanskrit has been written using different scripts at different times and places in history. Early text in India was written in Brahmi script (Devanāgarī: ब्राह्मीलिपः ; IAST: Brāhmīlipiḥ ; Chinese: 婆羅米文). The earliest writing in Brahmi is in inscriptions from King Ashoka, who unified India circa 269 BCE. 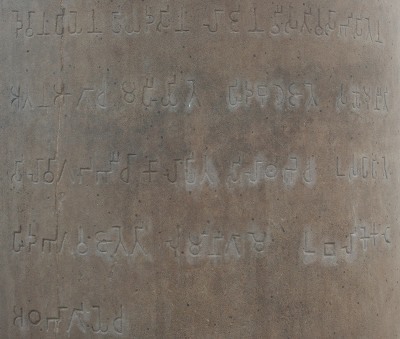 The picture below shows an Ashokan inscription from Lumbini, recording that it is the place of birth of the Buddha, that King Ashoka visited, and that the area is entitled to a reduction in tax. Note that the language is a prakrit, not Sanskrit. Brahmi script probably originated from Aramaic script. Most inscriptions in Brahmi script are for Prakrit, rather than Sanskrit. The Ashokan inscriptions were mostly written in Magadhi Prakrit in the eastern part of India and Kharoshthi script in the western part. Magadhi Prakrit is the language believed to be spoken by the Buddha. Kharosthi was another script used to write the Gandhari language, a kind of Prakrit, and Sanskrit. Kharosthi was derived from used in Aramaic in Gandhara at about the same time as Brahmi script. The Gandharan Buddhist Texts were written in Kharosthi have been discovered in Afghanistan. They date to the 1st century CE and are the oldest written Buddhist scripts known at present. Buddhist texts were also written in Brahmi. 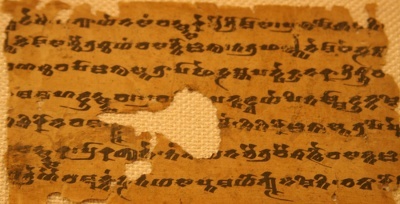 An example from a fragment of a Sanskrit manuscript from Dunhuang is shown below. Some Buddhist text were written in Sanskrit with Gupta script (Chinese: 笈多文). Gupta script evolved from Brahmi. A version of the Medicine Buddha Sutra written in Gupta Script was discovered in Gilgit, Pakistan. 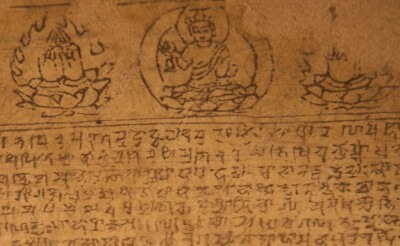 The picture below shows Sanskrit text from a dharani unearthed in Chengdu, China. Gupta Script gave rise to a number of other scripts, including Siddham (Devanāgarī: सिद्धं; IAST: siddhaṃ, Chinese: 悉曇文字), used circa 600 to 1200. Siddham then gave rise to Devanāgarī. Devanāgarī (Devanāgarī: देवनागरी ; IAST: devanāgarī ; Chinese: 天城文) has emerged in the last several hundred years as the standard way of writing Sanskrit. Ranjana script (Chinese: 蘭札文), which is similar to Devanāgarī, was used to write some sutras in historic times. (Everson 2009, p2) Ranjana script was the official script in Nepal and was transmitted to China via Tibet. The text of the Dvadasanga Ppratityasamutpada Dhrani writtin in Ranjana script from Dunhuang is shown below. Prachalit (Newar) is another script for writing Sanskrit that has been used for writing Buddhist sūtras in Newari Buddhist tradition in Nepal. (Pandey 2012, p2) Some of the manuscripts, such as Advayaparamārthā nāmasaṅgītiḥ, in the University of the West Digital Sanskrit Buddhist Canon were written in Newar. 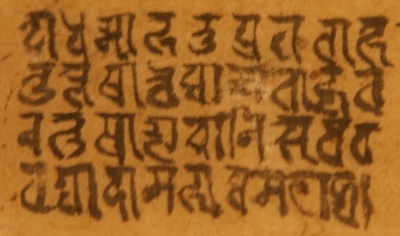 (UWest DSBC manuscript entry on Advayaparamārthā nāmasaṅgītiḥ) Prachalit script has been in use since the 10th century. It is descended from northern Gupta script. (Pandey 2012, p2) Prachalit is shown in the figure below. Which translates to, "Oṃ. Praise for the Buddha." Devanāgarī is now the standard script used to Hindi and Nepali. The picture below shows an inscription for the place of birth of the Buddha at Lumbini, Nepal. This document will use Devanāgarī. The Sanksrit Alphabet section below will introduce it. There are several schemes for transliterating Sanskrit into a representation that English speakers can read. The standard for academic publications is the International Alphabet of Sanskrit Transliteration (IAST). That is the system that I have used in this article. It uses many diacritics that are easy to read but difficult to type with a standard US keyboard. For example, Saṃskṛtam for Sanskrit and Aṣṭādhyāyī for Panini's text on Sanskrit grammar. To turn this into Latin just remove the diacritics. This may be the best course to follow for articles targeted for general readers because it will be a considerable detour for readers to learn IAST. However, be aware that you cannot reconstruct Devanāgarī if you remove the diacritics from IAST. Harvard-Kyoto and ITRANS are transliteration schemes that use only ASCII. They are easy to input but difficult to read because of their use of capitals in the middle of words and extra letters to take the place of diacritics. My suggestion for casual typing of Sanskrit is to work in Devanāgarī using online conversion tools (see below for tools) to convert into IAST. Use Harvard-Kyoto for input because it requires only ASCII. There is no capitalization in Devanāgarī, so I write all proper nouns beginning with a lower case letter in IAST in this document. The Brahmic family of scripts, including Devanāgarī, are actually abugidas rather than alphabets proper. An abugida, also called a alphasyllabary, is a writing system that writes each consonant–vowel sequences as a unit. Each consontant forms the basis of the unit with the vowel following indicated with notation, usually a diacritic. This will probably be your first surprise and barrier to learning Devanāgarī. There are thirteen vowels in Sanskrit. If not otherwise written each consonant is understood to be followed by schwa 'a' (pronounced like 'u' in but). The virāma diacritic suppresses this inherent vowel (schwa a) when it should be omitted. Various other diacritics are added above, below, and besides consonants in Devanāgarī to indicate other vowels. Table 4, shown below, lists the vowels as they decorate the consonant त t.
The sounds that are not present in English are described using phonetic terms and using International Phonetic Alphabet IPA) symbols. These terms are explained in the Basics of phonetics section below. Mouse over or click on the IPA symbols to find out more about the individual symbols. The vowels are mostly commonly seen decorating a consonant, as in the first column. Vowels are sometimes seen as initial letters, as in the second column. This are listed in Table 2 below. The vowel 'a' does not need a diacritic to decorate the consonant that it follows. So, if a consonant does not have a diacritic then 'a' is assumed to follow. For example प is 'pa'. The last column in the table above gives the approximate pronunciation using an English example. The 'a' sound in IAST is like a 'u' in but. For example, pundit in Sanskrit is पण्डित, IAST paṇḍita, and Harvard-Kyoto paNDita. Oṃ has the special symbol ॐ in Devanāgarī. Oṃ uses the chandrabindu diacritic ँ is sometimes used instead for nazalization. It is usually omitted from Devagari charts. The chandrabindu is used in the context of Vedic Sanskrit, for example पँ. An apostrophe represents a missing a. It is written in Devanāgarī as ऽ (avagraha). This is used, for example, Jeta Grove, in Anāthapiṇḍada’s park (IAST: jetavane'nāthapiṇḍadasyārāme, Devanāgarī: जेतवनेऽनाथपिण्डदस्यारामे, Chinese: 祇樹給孤獨園), which is mentioned in Chapter 1 of the Diamond Sutra. The A in Anāthapiṇḍada is left out and replaced with an apostrophe in the IAST and ऽ in the Devanāgarī. The Devanāgarī letters for initial vowels are written differently. The table above lists the initial vowels as they match the equivalent forms that accompany consonants. Table 5 lists them as they would be written as the first letter in a sentence or entry in the dictionary. Anusvāra uses the diacritic ं (decimal Unicode 2306) to indicate nasalization with a final n or m. This is represented with an ṃ in IAST or M in Harvard-Kyoto. For example, तं taṃ (he in English) and तां tāṃ (her in English). Visarga is the diacritic ः (decimal Unicode 2307) that looks like two dots in the shape of a colon after a syllable to represent aspiration. It is written in IAST as ḥ and H in Harvard-Kyoto. For example, तः, which is taḥ in IAST and taH in Harvard-Kyoto. The symbols for anusvara and visarga are listed in Table 6. There are many more consonants in Sanskrit than English. One reason is the large number of plosive consonants (stops). These are listed in Table 7 in traditional order. Tones are used in Vedic Sanskrit. There are three tones: उदात्त udātta (raised), अनुदात्त anudātta (not raised), and स्वरित svarita (sounded). The udātta is marked with an acute accent (e.g. í, ó) and the other tones are not marked. However, sometimes svarita may be marked with a grave accent (e.g. à) in situations where independent svarita is caused by sandhi of adjacent vowels. See the discussion below on sandhi. Sandhi is a set of phonological rules used to combine sounds into words and to combine words into sentences. An example in English is the use of the word the. If the precedes a word beginning with a consonant then it is pronounced [ðə], as in the bus (General American and British English). If it precedes a word begining in a vowel it is pronounced [ði], as in the end. In English these phonetic differences are spelled the same. However, in Sanskrit these differences are spelled out and prescribed by sandhi. The term sandhi is also used today by phonetitions to refer to similar phonetic changes in languages other than Sanskrit. There are two kinds of sandhi: internal and external. Internal sandhi is sound changes within a word. External sandhi is sound changes when connecting two words. Sandhi between two words depends on whether the final sound in the first word is a vowel or a consonant and whether the initial sound in the second word is a vowel or a consonant. Table 8a below lists Sandhi for combinations where the first word ends in a vowel and the second word begins in a vowel. Table 8b lists sandhi for combinations where the first word ends in a consonants. An example from the Diamond Sūtra is the compound paramapāramiteti, which formed from the three parts parama (foremost) + pāramitā + iti (said), meaning said to be the foremost pāramitā. Find the column a / ā and the row i / ī and see that the table cell contains an e. So the word result is paramapāramiteti. If the vowel before n is short then it becomes nn. When d is followed by h the h becomes dh. When d is followed by ś the ś becomes ch. When n is followed by ś the ś may become ch. The cells of tables 4a and 4b represent the letter that the last letter of the first word should be changed to. After the sandhi rules have been applied to a pair of words, if the second word ends in a vowel or ḥ then there should be a break in the words when written in Devanāgarī. In IAST words are usually separated, except when Sandhi rules result in vowels joining together. For example gacchati iti -> gacchatīti (he says that he is going). For the final letter ḥ there are three cases: aḥ, āḥ, and any other vowel + ḥ. The (aḥ, āḥ, other vowel + ḥ) is replaced with the value in the cell, except for the exceptions listed in the table notes. An example for the aḥ ending is rāmaḥ gacchati -> rāmo gacchati (Rama is going). An example for the āḥ ending is vīrāḥ gacchati -> vīrā gacchati (the hero is going). If a word ending in a vowel is followed by a word starting with a vowel then there is no change. There is an exception to this for short vowels followed by ch. The ch is changed to cch. If a long vowel is followed by ch then the ch may or may not change to cch. An r or ṛ changes the following n to ṇ. For example, treatises śāstraṇi (IAST: śāstraṇi, Devanāgarī: शास्त्रणि, Chinese: 論), which is the nominative and accusative case, plural form of the stem śāstra. For example, in the word putrāṇām, which is the Genitive plural form of the stem putra (English: son), n is changed to ṇ. However, this does not happen when there is a t in between. For example, immortals (IAST: amṛtāni, Devanāgarī: अमृतानि), which is the nominative and accusative case, plural form of the stem amṛta. Besides t there are a number of other sounds that prevent n changing to ṇ. The letter s changes to an ś if it is preceded by a vowel unless it is the final letter or it is followed by an r. However, if the following sound is t, th, or n then s changes to ṣ instead. For example, the s in the verb root √sthā (English: to stand) changes to an ṣ in the word tiṣṭhati (English: he stands). After sandhi has been applied you can decide whether to insert a space between words. If the first word ends in a vowel, ḥ, or ṃ then the Devanagari will have a break. If the first word ends in a vowel and the second word begins in a vowel then the two words will be joined in both Devanagari and IAST. For example, gacchati + iti becomes gacchatīti (he says that he is going). This convention varies somewhat from text to text. Table 9 below shows the Sanskrit cardinal numbers. The declensions of the cardinal numbers are complex. The ordinal numbers declensions are like adjectives in that they have two forms: (1) masculine and neuter and (2) feminine. Table 10 shows the ordinal numbers. Table 11 below lists the powers of ten for numbers in Sanskrit. Some of the very largest numbers are left out. Sanskrit has a number of grammatical characteristics that are not found in English. Some of these are found in other European languages and even more of these characteristics are found in ancient European languages and is generally closer in form to the Proto-Indo-European parent. Sanskrit is an example of a fusional language, that is, a language where words are heavily inflected based on gramatical function. The characteristic of fusional languages is that there are many more morphemes than words. English retains some of original fusional nature of the common parent Proto-Indo-European but word order and use of prepositions are much more important in determining gramatical function. An isolating language has few words are inflected based on gramatical function. Chinese is the classic example of an isolating language because it has no inflection of words. English is regarded as largely an isolating language because there are far fewer inflections than fusional languages like Sanskrit. A morpheme is the smallest meaningful unit in a language. It is not necessarily the same thing as a word, which may consist of several morphemes. For example, sing, sang, and sang are all morphemes for one word. In a good English dictionary you can find all the irregular inflections of words. However, in Sanskrit there are far too many inflections for the dictionary to list them all. This makes learning and analysing Sanskrit text a particular challenge. See The History of English: a Linguistic Introduction [Scott 2008] for a readable introduction to the kinds of inflections and gramatical structure of Proto-Indo-European examples in modern English. This section will give a brief overview of Sanskrit grammar. The basic goal of this section is to gain an overall picture of Sanskrit grammar and be able to apply that to the task of looking up words you may encounter in a Sanskrit dictionary. For a more comprehensive information on Sanksrit grammar see the References section. Sanskrit nouns can be inflected with gender (male, female, and neuter), number (singular, dual, and plural), and case. Grammatical case (IAST: vibhakti, Devanāgarī: विभक्ति, Chinese: 格) is inflection of a noun or pronoun to indicate its function within a sentence. The two most fundamental cases are the nominative case and the accusative case. The nominative case (IAST: prathamā, Devanāgarī: प्रथमा, Chinese: 主格) usually marks the subject of a sentence. The accusative case (IAST: dvitīyā, Devanāgarī: द्वितीया, Chinese: 對格) marks the direct object of a transitive verb. In English there are no changes in case for nouns but there are some changes for pronouns. For example, in the English sentence, 'I saw him,' the word I is the nominative case and the word him is the accusative case. By contrast, in the English sentence, 'He saw me,' the word me is the accusative case and the word he is the nominative. This section will give a brief description of the ways that nouns are inflected. There are eight grammatical cases in Sanskrit, which is the same as Proto-Indo-European. Old English nouns had four of these: nominative, genative, dative, and accusative [Shay 2008]. Table 12 below summarizes the different cases. In the table above the last column gives the inflected forms for the singular for vadhū woman (Devanāgarī: वधू; IAST: vadhū; Chinese: 女人). The stem form is vadhū. The nominative case is usually marked with a ḥ ending and the accusative case is often marked with a ṃ ending. For example, the stem form for teacher is ācārya (Devanāgarī: आचार्य; IAST: ācārya; Chinese: 阿阇黎), the nominative case is ācāryaḥ (Devanāgarī: आचार्यः), and the accusative case is ācāryaṃ (Devanāgarī: आचार्यं). The instrumental case (IAST: tṛtīyā, Devanāgarī: तृतीया, Chinese: 工具格) is used when a noun is the instrument of an action. It is the third case for Sanskrit nouns, hence the name tṛtīyā. For example, if water (IAST: jala, Devanāgarī: जल, Chinese: 水) is the agent of an action then the instrumental case jalena जलेन should be used. More examples are the instrumental case for the word for the word for suffering (Devanāgarī: दःख, IAST: duḥkha, Chinese: 苦) duḥkhena दासेन, and for yoga (Devanāgarī: योग, IAST: yoga, Chinese: 瑜伽) yogena योगेन. Because of sandhi rules an ena is used for the instrumental singlur form if there is no r or ṛ in the word. For example, aśvena (horse) and gajena (elephant) and the instrumental case, singular forms for the stems aśva and gaja. However, the instrumental case, singular forms for putra (son) is putreṇa (Devanāgarī: पुत्रेण) and for mṛga (deer) is mṛgeṇa (Devanāgarī: मृगेण). The dative case (IAST: caturthī, Devanāgarī: चतुर्थी, Chinese: 與格) may be used to indicate a purpose. In the section Written Sanskrit we saw the example "namo buddhāya" from the Digital Sanskrit Buddhist Canon. The Sanskrit verb namo is transliterated to Chinese as 南無 because it is not easy to translate. It may be translated to English as praise. The Sanskrit buddhāya is the dative case of buddha, so we can translate this phrase as "praise for the Buddha." The ablative case (IAST: pañcamī, Devanāgarī: पञ्चमी, Chinese: 離格) is the fifth case in Sanskrit. It indicates motion away from an object or that the object is the source of an action. The genitive case (IAST: ṣaṣṭhi, Devanāgarī: षष्ठि, Chinese: 屬格) is the sixth case in Sanskrit. It indicates possession. The locative case (IAST: saptamī, Devanāgarī: सप्तमी, Chinese: 屬格) expresses location. It is the seventh case for Sanskrit nouns. Singular locative nouns often end with an me, such as grāme (village) and gaje (elephant). The vocative case (IAST: saṃbodhana, Devanāgarī: संबोधन, Chinese: 呼格) is used for addressing people. It is the eighth and final case for Sanskrit nouns. It is usually the same as the stem form. For example, rāma (the name Rama) or nara (man). Nouns can be either masculine, neuter, or feminine. Grammatical gender affects the declension of nouns. An example of a masculine noun is dharma. An example of a neuter noun is phala (English: fruit). An example of a feminine noun is śūnyatā (English: emptiness). Since there are eight cases and three forms for number (singular, dual, plural) there are twenty four possible forms for a noun. However, there will usually be less than 24 because some of the forms may be the same. Table 13 gives word changes for changes in word form for case and number for the masculine word man, which has stem form nara. This provides an important rule when searching dictionaries for Sanskrit words encountered in the different cases. For example, when searching for a word ending in ḥ or ṃ remove the final letter to give the most likely text for the reference form of the noun. Usually, dictionaries will only list a reference form, usually the stem form or singular nominative. We will see below in the section Sentence Types that adjectives describing nouns are often modified to match the case of the noun. So, this same convention applies to looking for adjectives in dictionaries. Dual form can often be recognized by the au ending. For example, the dual form for the Sanskrit word for foot (singular form: pāda) is pādau (Devanāgarī: पादौ). The Sanskrit word nara (English: man) is a masculine noun. Other examples of masculine nouns are horse (IAST: aśva, Devanāgarī: अश्व, Chinese: 馬), teacher (IAST: ācārya, Devanāgarī: आचार्य, Chinese: 阿闍黎), and elephant (IAST: gaja, Devanāgarī: गज, Chinese: 象). The morphology changes are different for neuter and feminine nouns. The morphology changes for the neuter word phala (English: fruit) are given in Table 14. Other examples of neuter nouns are the nectar of immortality (IAST: amṛta, Devanāgarī: अमृत, Chinese: 甘露), knowledge (IAST: jñāna, Devanāgarī: ज्ञान, Chinese: 智), book (IAST: pustaka, Devanāgarī: पुस्तक, Chinese: 書), and action (IAST: karma, Devanāgarī: कर्म, Chinese: 業). Changes in word endings for the feminine word senā (English: army) are listed in Table 15. Other examples of feminine nouns ending in ā are story (IAST: kathā, Devanāgarī: कथा, Chinese: 故事), girl (IAST: kanyā, Devanāgarī: कन्या, Chinese: 女孩), shadow (IAST: chāyā, Devanāgarī: छाया, Chinese: 影), and daughter (IAST: putrikā, Devanāgarī: पुत्रिका, Chinese: 女兒). The changes in word form are different for words ending in i. The morphology changes for the masculine noun agni (English: fire) are given in Table 16. An example of a masculine i-stem word used in the Diamond Sūtra is ṛṣi (English: sage, Chinese: 仙人). The morphology changes for the neuter noun vāri (English: water) are given in Table 17. The morphology changes for the feminine noun kīrti (English: glory) are given in Table 18. An example of a feminine i-stem word used in the Diamond Sūtra is bodhi (English: enlightenment, Chinese: 菩提). The feminine i-stem declinations are slightly different from the ī-stems. The morphology changes for the feminine noun nadī (English: river) are given in Table 19. An example of a feminine ī-stem word used in the Diamond Sūtra is nadī (English: river, Chinese: 河). Actually, nadī also has a masculine form nada, which means river as well. The feminine form is used when the Ganges is referred to. the Diamond Sūtra uses the compound gaṅgānadīṣu (English: in the Ganges River, compound from: gaṅgā + nadīṣu), which is the locative case, plural form. How can we talk about the Ganges River in plural? The Buddha describes the number of Buddha worlds as being comparable to the number of grains of sand in the a number of Ganges Rivers (gaṅgānadīvālukāsamān), and each one of those grains representing a Ganges River, then the total number of grains of sand. That is, take the number of grains of sand in the Ganges, imagine a number of rivers with that number, and then imagine the total number of grains of sand. That is an enormous number. Sanskrit has both personal and demonstrative pronouns and these take the same form. A demonstrative pronoun is a function word that refers to something, usually represented by a noun or pronoun elsewhere in the text. In English and Chinese the demonstrative and personal pronouns take different forms. Examples of demonstrative pronouns in English are this and that. Examples of personal pronouns in English are I, you and it. The Sanskrit word eṣaḥ (Devanāgarī: एषः, Chinese: 这) is similar to the word this in English. Note that the genders are grammatical, not physical. So a masculine pronoun in Sanskrit could refer to an object with a masculine grammatical gender as well as a male person or animal. Sanskrit pronouns are declined in the same way as nouns. Table 20 lists the different forms of the first person pronouns (English: I, me, us; Chinese: 我、我們). They apply to all genders. Most Buddhist sūtras begin with the words, evaṃ mayā śrutam (English: Thus have I heard, Chinese: 如是我聞). The word mayā (English: I, Chinese: 我) is a first person, singular pronoun in instrumental case. Table 21 lists the different forms of the second person pronouns (English: you; Literary Chinese: 汝). They apply to all genders. Third person pronouns have declensions for all three grammatical genders. The third person pronoun stem form for the masculine gender is tad (English: he, they; Chinese: 他, 他們). The declensions are listed in Table 22. Here teṣu is the locative case, plural form of the third person pronoun (English: those). Sanskrit third person pronouns can be used as either personal pronouns, such as the English word it, or demonstrative pronouns that. Here teṣu is used as a demonstrative pronoun equivalent to the English word those. A demonstrative pronouns go in front of the noun that it refers to. In this example teṣu comes before lokadhātuṣu. The locative case, plural form lokadhātuṣu (English: worlds or lands, Chinese: 國土) is also used. The word sattvāḥ (English: beings, Chinese: 眾生) is in the nominative case, plural form because it is the subject of the sentence. The full sentence is longer. The third person pronoun forms for the neuter gramatical gender (English: it; Chinese: 它, 它們) are listed in Table 23. The third person pronoun forms for the feminine gramatical gender (English: she; Chinese: 她, 她們) are listed in Table 24. Relative and correlative pronouns are found in pairs. An example from the Diamond Sūtra is shown below (Chapter 17). The Sanskrit word sa (English: he) is the correlative pronoun and the word yo (English: who) is the relative pronoun. Both sa and yo refer to kaściddharmo (English: any dharma), is the antecedent. The antecedent goes directly before the relative pronoun. Relative and correlative pronouns must agree with each other in number and gender. The declension for the relative pronoun yad is shown in Table 25. A clitic is a function word that depends on a connected word for its pronunciation. For example, in English either the clitic a or the clitic an is chosen based on the word that follows it. For example, a banana or an orange. The English articles a and an are proclitics because they appear before their hosts. The English possessive marker 's is an enclitic because appears after its host. Clitics are often particles, which are uninflected function words. Sanskrit also has clitics but they are different in form compared to English. The Sanskrit enclitic particle eva (Devanāgarī: एव) emphasizes the previous word. It may be translated into Enlish or Chinese as really (Chinese: 真). The enclitic particle vā (Devanāgarī: वा, Chinese: 或) is an enclytic particle used to form a disjunction (or), as in ... vā ... vā (either .. or ..). The enclitic particle ca (Devanāgarī: च, Chinese: 和) is similar for the English word and. The words kṛtam (Devanāgarī: कृतम्, Chinese: 夠) and alam (Devanāgarī: अलम्, Chinese: 夠) mean enough. They are used to exhort somebody against doing something. Sanskrit interrogative words usually begin with a k, like the wh words in English (what, where, etc). The Sanskrit word for where is kutra. This is the man that I saw. Relative-correlative adverb pairs are shown in Table 26. Adjectives are modified by the same set of rules as nouns, following the nouns that they modify. In particular, an adjective must match the case of the noun that it modifies. A example is the phrase kuśalā dharmāḥ (English: pure dharmas) from the Diamond Sūtra. The nominative, plural form kuśalāḥ of the adjective kuśala (English: pure or wholesome) is used to match the nominative, plural form of the noun dharma (dharmāḥ). Applying sandhi transforms the ending āḥ to ā when followed by the first letter d, so the phrase becomes kuśalā dharmāḥ. A second example is the phrase anāgataṃ cittaṃ (English: the future mind), also from the Diamond Sūtra. The Accusative form of the adjective anāgata (anāgatam) (English: future) is used to match he Accusative form of the noun citta (cittam). Applying sandhi transforms the final m to ṃ so the phrase becomes anāgataṃ cittaṃ. An adjective must also match the noun that it modifies in number and gender. Dictionaries, such as Monier Williams, give an abbreviation like mfn for entries that are adjectives. This means that the adjective is the masculine, feminine, and neuter form. If an entry is has a mfn then the feminine form will usually end in ā. Examples of adjectives with the feminine form ending in ā are kupita (English: angry) and bhīta (English: afraid). Other adjectives have feminine forms ending in ī. These will have a dictionary entry like mf(ī)n or mf(ई)n. Examples of adjectives with feminine forms ending in ī are dhārmika (English: virtuous) and sundara (English: beautiful). Sanskrit verbs can be modified based on tense, aspect, mood, number, and person. This modification is known as inflection, which is the modification of words to fit with the grammatical structure of the text that they are part of. For example, in English the inflected forms of the stem work are work, works, working, and worked. There are also other forms with prefixes, for example rework. Inflection is a source of great difficulty for learners of English as a second lanugage but Sanskrit is much richer in inflected forms of verbs. For more on the concepts behind inflection in languages in general see the book Linguistics [Baker and Hengeveld, 2012 chaper 12]. Some simple examples of verb inflection is for first second and third person are shown in Table 27. Thematic vowels are inserted into words after the stem and before the ending. Thematic vowels are not used in English. In Sanskrit the theme vowel is अ (a). The presence or absence of thematic vowels divides verbs into thematic verbs and athematic verbs. Sanskrit has dual verbs, which is a concept that English does not. This combines with the first, second, and third person forms. For example, gaccha (go) becomes gacchatah (gaccha + tas) those two go. Dual forms are for the word gaccha are shown in Table 28. Word morphology changes for grammatical person (first, second, and third) combine with number (singular, dual, and plural) as shown in Table 29 below. These are the present indicative forms. The ending tas becomes taḥ when the word is a verb. Similarly, for the first and second person forms. Verb endings in Sanskrit depend on voice, which can be active, middle, or passive. Some verbs can have both active and middle voice forms. With the active voice the result of an action goes to the object. Examples of active verbs are he goes (IAST: gacchati, Devanagari: गच्छति, Chinese: 去), he conquers (IAST: jayati, Devanagari: जयति, Chinese: 勝), he reads (IAST: paṭhati, Devanagari: पठति, Chinese: 讀), and he sees (IAST: paśyati, Devanagari: पश्यति, Chinese: 見). Sanksrit also has a middle voice where the result of the action goes to the agent (subject). Examples of middle voice verbs are he says (IAST: bhāṣate, Devanagari: भाषते, Chinese: 說), he thinks (IAST: manyate, Devanagari: मन्यते, Chinese: 意), he obtains (IAST: labhate, Devanagari: लभते, Chinese: 拿), he serves (IAST: sevate, Devanagari: सेवते, Chinese: 服務), and he knows (IAST: bodhate, Devanagari: बोधते, Chinese: 覺). Verb conjugation for the middle verb with root √bhāṣ (to speak) are shown in Table 30. Some verbs can take both active and middle voice. For example, the verb with root √cint (to think) can take both the active voice cintayati and the middle voice cintayate. The verb root √as means "to be" (Chinese: 有) and is used as a cupola. It is similar in meaning to verb root bhū but more common. The word endings are for √as are similar to active verbs. The different forms of this verb are listed in Table 31. The Sanskrit word nāsti (English: to not be, Chinese: 無有) is the antonym of asti (English: to be). It is actually formed from two parts: na + asti with sandhi applied. An example from the Diamond Sūtra is nāsti dharma (no such dharma). The examples so far have been present tense. An example of conjugation of the root √budh (English: know, Devanagari: बुध्, Chinese: 覺) are bodhati (present), buddhvā (gerund), and bhotsyati (future). Conjugation for other verb are shown in Appendix 2. There are four forms in the present system: present tense, imperfect, operative mood, and imperative mood. A gerund is formed from a verb but does not take verb endings and acts somewhat like a noun. Sanskrit gerunds are different from English gerunds. For example, the gerund uditvā is equivalent to the English having spoken. Some examples of gerunds used in the Diamond Sūtra are kṛtvā (English: having done, literary Chinese: 用), śrutvā (English: having heard, literary Chinese: 聞), and caritvā (English: having moved, literary Chinese: 行). The gerund is not declined. It is usually formed by adding the suffix -tvā. For example, the root √dṛś becomes dṛṣṭvā and the root √gam becomes gatvā. When there is a prefix, then the suffix becomes -ya. For example, the root ā + √gam becomes āgamya (English: having come). The gerund is also called the absolutive. The ending here is t.
The different forms of the imperfect are shown in Table 33. The augment goes after the prefix but before the stem. For example, pratyagacchat (English: he returned). Sandhi is applied here prati + a -> pratya. A participle is the form of a verb used when it acts as a modifier. For example, in English the word acting is the present participle of the verb act, as in the phrase acting director. The word attached is the past participle of the verb attach, as in the phrase attached files. Another example in English is the past particle sunken, as used in the phrase sunken treasure. In Sanskrit the past particple is formed by appending one of -ta, -ita, or -na to the stem. Examples of the first form with ending in -ta are hata (Devanāgarī: हत, IAST: hata, Chinese: 殺) meaning killed, which modifies the stem han, and sthita (Devanāgarī: स्थित, IAST: sthita, Chinese: 站) meaning standing or remaining standing, which modifies the stem sthā. In some cases there are modifications for internal sandhi. An example of the second form with ending in -ita is patita (Devanāgarī: पतित, IAST: patita, Chinese: 落) meaning fallen. There are ten classes of conjugation of Sanskrit verbs. These are referred to as classes I through X. Classes I, IV, VI, and X are thematic and the other classes are athematic. Conjugation is based on a stem, which may not be a verb in its own right. Conjugation of thematic verbs is by strengthening vowels. There are two successive grades of strengthening: guṇa and vṛddhi. The vowel strengthening is shown in the Table 34. In many examples the third person singular ति ti (English he) is added to the stem. For thematic classes an 'a' will inserted before this. For example, the class I form भर् bhar (English: bear) becomes भरति bharati (English: he bears). This is dervied from the stem भ्र् bhr by the vowel degredation process above. A compound word is one formed from multiple stems. This is also one of the major processes of forming new words in the world's languages. For example, barefoot in English. Sanskrit has both short and long compound words but long compound words is one of the particular characteristics of the language. An example of a short compund is हिमालय himālaya, formed from two words, literally meaning abode of snow. An example of a longer compound is the Sanskrit name for the Sutra of the Medicine Buddha भैषज्यगुरुवैदूर्यप्रभराजसूत्रम् (IAST: bhaiṣajyaguruvaidūryaprabharājasūtram). The lack of space between the words makes it very difficult for native English speakers to read. Also, unlike English and Chinese, the number of combinations is unlimited and cannot be listed in dictionaries. If we do not recognise the parts of a compound word, how can we find out what they are? There are a number of characteristics of compound words that give clues. One clue is that, whereas most Sanskrit words are inflected in some way, the indivual parts, except the last part, of Sanskrit compound words are all in stem form. Stem form is the form given in dictionaries and lacks an ending that indicates case. For example, aśva (horse) is a stem form. A coordinative compound is compound that joins the parts together with the same meaning as the English conjunction and. For example, ācārya-śiṣya (Devanāgarī: आचार्यशिष्य) means teacher and pupil. The number of the compound is the sum of the number of each part. For example, the word for parents, literally mother and father, mātāpitarau (Devanāgarī:मातापितरौ; Chinese: 父母) is in dual form. Here the dual form for horse aśvau is used so the adjective swift śīghrau must match it. Compare that to the reference forms for horse aśva and swift śīghra. This example can also act as a phrase meaning the two swift horses. This kind of adjective-noun agreement provides another example of word changes that need to be accounted for when searching for the reference forms in dictionaries. In English and Chinese grammatical function within a sentence is usually determined by word order. Most often in English and Chinese the subject comes first followed by a verb followed by the object. For example, if we change the sentence The batsman hit the ball to The ball hit the batsman, the meaning is changed entirely. In contrast, grammatical function is most often marked by changes in word forms in Sanskrit than word order. The word order may be changed without changing the meaning. When transliteration is used and when meaning is translated in translating from Sanskrit to Chinese. Transliteration was mostly used when for names of a people and places. In addition, according to ..., transliteration was used when (1) there was no equivalent word in Chinese, (2) when there was more than one meaning, and (3) when there was a secret meaning. Some of the vowels and consonants in Sanskrit can be difficult to describe without some technical phonetics terms. In addition, the are various resources on Sanskrit can be difficult to understand without a background in phonetics. This section is included to provide a simple explanation of some of the basic terms. Often the IPA symbols are written in between forward slashes //, used for a phonetic description of how the sounds should be understood. Usually, a broad transcription, which is a phonetic approximation, is given. Occasionally, square brackets  are used, indicating what is actually spoken. In this case, a narrow transcription, which is a more accurate phonetic description, may be given. A voiced consonant is articulated with the vocal chords vibrating producing sound. The English consonant [b] is an example of a voiced consonant. An voiceless sound is articulated without the vocal chords vibrating. For example, the English consonant [p] is the voiceless equivalent of the voiced consonant [b]. An oral stop, also known as a plosive consonant, blocks all of the airflow for a brief period as the sound is articulated. The air can be blocked with the blade of the tongue, the body of the tongue, or the lips. If the air is blocked with the blade of the tongue, as with the English consonants [t] and [d], it is called a apical consonant. If the air is blocked with the body of the tongue, as with the English consonants [k] and [g], then it is called a velar consonant. If the air is blocked with the lips, as with the English consonants [b] and [p] then it is called a bilabial consonant. With a nasal stop sound is articulated through the nose, for example with English [m] and [n]. An approximant consonant is between a fricative and a vowel. An important class of approximant is the liquid consonant class. A liquid consonant is either a lateral consonant or a rhotic consonant. A lateral consonant is articulated with air flowing through the sides of the mouth and the center blocked. An example is the English consonant l. A rhotic consonant is an r-like sound. An aspirated is one that is accompanied by a burst of air. For example, in English the b in bin is aspirated but the p in pin is not. A retroflex consonant is articulated with a curled tongue as in the English sh in ship, ch in chip and s in vision, and also s in sip and z in zip. A fricative consonant is produced by forcing air in the mouth through a narrow channel. English examples are s and z. See the University College London Educational Resources in Speech, Hearing and Phonetic Sciences page listed in the References section for web tutorials on phonetics. For more comprehensive information see the book Phonetics: Transcription, Production, Acoustics, and Perception (2011) by Henning Reetz and Allard Jongman. To display Sanskrit text you will need at least one font installed that can display Devanāgarī. You will most likely be reading Unicode encoded documents. It is wise to have a Unicode font installed with a wide range that includes the Devanāgarī Unicode range. It is likely that the basic Unicode font that you have installed will not cover the Devanāgarī Extended range. However, you may be able to do without that to display most documents. See Alan Wood’s Unicode Resources listed in the References section for links to fonts that can display Devanāgarī text and instructions for installing the fonts on different platforms. While Devanāgarī and Brahmi scripts are already part of the Unicode 6.3 standard (Unicode Consortium 2014, ch 9-10), Pracalita, Ranjana, and Siddham are not. For information on Pracalita script and fonts, see the SIL ScriptSource page on Newar and the Proposal to Encode the Newar Script in ISO/IEC 10646 (Unicode). (Pandey 2012a). For information on Ranjana script and fonts, see the SIL ScriptSource page on Ranjana. For information on Siddham, see the Proposal to Encode the Siddham Script in ISO/IEC 10646. (Pandey 2012b). One initial difficulty with Devanāgarī for searching within single text documents are the diacritics for vowels after consonants in addition to anusvāra (nasalization). Commonly, you will see a letter in a word and search for it but not find it in a table of Devanāgarī letters. This is because the diacritics interfere with the search mechanism. If you are dealing with your own documents then the solution is to use a transliteration tool to find out how to pronounce the letter. A similar problem occurs when search for terms on the web. This can be troublesome when searching for difficult terms, especially names or people and places in historic times, on the web. Again you can use transliteration tools if you are doing the searching. If you are creating web pages then it is a good practice to provide the Devanāgarī and also the IAST and Latin transliterations. Store files in UTF-8 format. You should see this as an option when saving files. That way you will be able to work with Devanāgarī, IAST, and Chinese all in the same file. To read Sanskrit you will need to have the correct fonts installed. You will know if you do not have the correct fonts installed if you see square boxes. A good Unicode font may provide all the support you need. If that is not sufficient then try installing fonts for Sanskrit, Devanāgarī, Indian languages, and Hindi. If you have trouble with IAST characters try installing extended Latin. Input methods for Devanāgarī are readily available. They may be listed as either Sanskrit, Devanāgarī, or Hindi. Try Sanskrit as a first choice and Devanāgarī or Hindi as second choice. On my workstation, a Linux Ubuntu system, Sanksrit is supported directing as a system language. IAST may be more of a challenge to input. You will probably need conversion tool to convert Devanāgarī to IAST. Try the IAST-Devanāgarī-IAST Converter listed in the References section. This tool is also useful for converting IAST to Devanāgarī. If you are stuck on an input tool for Devanāgarī then you can use the Harvard-Kyoto scheme, which relies only on Latin characters. Then you can use a converter like Indian.language.unicode.converters (see References) to convert to Devanāgarī. In addition to Unicode ranges for Devanāgarī and Devanāgarī Extended there are also Unicode ranges for Brahmi and also for Vedic Extensions. See Alan Wood’s Unicode Resources listed in the References section for listings of these Unicode ranges with numeric codes. For displaying Prachalit and Ranjana see the links for the SIL ScriptSource entries on Newar and Ranjana, the www.jhinewah.org pages on Nepalese Scripts, and Manandar (2012). You may have problems displaying International Phonetic Alphabet (IPA) Symbols if you do not have the correct fonts installed. See the page The International Phonetic Alphabet in Unicode by John Wells for links to fonts capable of displaying IPA Symbols and for their Unicode values. Diacritics can be specified by adding the Unicode symbol for the diacritic after the regular Latin letter. For example, to add a tilda ̃ to the symbol /ɔ/ enter the HTML code below. The web page Unicode Entity Codes for Phonetic Diacritics by Penn State University lists the codes for the diacritics and explains how to use them in HTML pages. There are a number of useful software tools below. In preparing this page I constantly used the IAST-Devanāgarī-IAST Converter from ePandit Labs. The Sanskrit Heritage Site has a number of tools for analyzing Sanskrit grammar, including tools for declination of stems, conjugation of verbs, segmenting sentences, and sandhi conversion. The Spoken Sanskrit site has a dictionary that is easy to use and a Sandhi tool. This is the dictionary that I have had the best experience with. There are many resources for learning more about Sanskrit below. The Sanskrit Voice and Sanskrit Studies web site has resources for contemporary use of Sanskrit and links to places to study Sanksrit in India. The American Sanskrit Institute web site has links for places to study in the United States. The ITT Madras Learn Sanskrit page has online resources for learning Sanskrit, including sound files. The book Fanyu Keben [Luo Shifang, 2012] is a good resource for Chinese to Sanskrit, although it is written in Chinese. The National University of Taiwan Digital Library and Buddhist Studies page has resources for Buddhist texts written in Sanskrit and online Sanskrit lessons with based on Buddhist texts. The Buddhist Door Dictionary has IAST transliterations of many Buddhist terms. Many dictionaries and sources do not use standard transliterations, making it hard to determine the Devanāgarī text. A number of references on Sanskrit used technical linguistics concepts. Understanding these concepts can be very useful in studying Sanskrit and you can find books explaining the subject in list below, including Baker and Hengeveld , Culicover , Henning Reetz and Allard Jongman, and Saeed . The book The History of English: a Linguistic Introduction by Shay  gives a background on the history of Indo-European languages and the principles of the changes that took place over time. For an introduction to Hindu concepts see the explanation in the book Bhagavad Gita [Schweig 2007]. American Sanskrit Institute, web site at www.americansanskrit.com/. Ashtanga Yoga, Transliteration & Transkription Tool, at www.ashtangayoga.info/philosophy/transkription-tool/. Baker, A. E. and Hengeveld K., 2012. Linguistics. Wiley-Blackwell, ISBN 978-0-631-23035-9 (cloth), ISBN 978-0-631-23036-6 (pbk). Culicover, P., 2009. Natural Language Syntax, Oxford University Press, ISBN 978-0-19-923018-1. Edgerton, Franklin. Buddhist Hybrid Sanskrit Grammar And Dictionary. http://doc.thanhsiang.org/Online_Dic/Buddhist_Hybrid_Sanskrit_Dictionary/index.html. Egenes, Thomas. Introduction to Sanskrit: Part One. Motilal Barnarsidass Publishers, New Delhi, Forth Edition, 2011. ISBN 978-81-208-1140-9. Everson, Michael. Roadmapping the scripts of Nepal. International Organization for Standardization, Working Group Document. 09-09-28. http://std.dkuug.dk/jtc1/sc2/wg2/docs/n3692.pdf. Gayathrimanthra Library, at www.gayathrimanthra.com/Library.html. Hindu texts in Sanskrit. Gethin 1998. The Foundations of Buddhism, Oxford University Press, ISBN 0-19-289223-1. Henning Reetz and Allard Jongman, Phonetics: Transcription, Production, Acoustics, and Perception, John Wiley, ISBN-13: 9781444358544. Huet, Gérard. 2014. The Sanskrit Heritage Site. http://sanskrit.inria.fr. ITT Madras, Learn Sanskrit page, acharya.iitm.ac.in/sanskrit/tutor.html. Jayapal Chandran, Sanskrit (Harvard-Kyoto scheme) converter, at vikku.info/indian-language-unicode-converter/sanskrit-unicode-converter.html. jhinewah.org. Nepal Lipi - The Nepalese Scripts. Web page with links to Prachalit and Ranjana fonts at http://www.jhinewah.org/Newar/scripdwn.html. Luo Shifang, 2012. Fanyu Keben (Sanskrit Textbook), Commercial Press, ISBN 978-7-100-01005-4 (in Chinese). Manandar, Dev Dass. Proposal for Nepalipi Script in the Universal Character Set for Inclusion in the Unicode Standard. 2012. International Standards Organization. http://std.dkuug.dk/JTC1/SC2/WG2/docs/n4322.pdf. Monier Williams Online Dictionary. Accessed March 2, 2014. http://www.sanskrit-lexicon.uni-koeln.de/monier/. Macdonnell, Arthur Anthony, 2009. A Practical Sanskrit Dictionary. Online at http://dsal.uchicago.edu/dictionaries/macdonell/index.html. Omniglot International Phonetic Alphabet page, www.omniglot.com/writing/ipa.htm. Pandey, Anshuman. Proposal to Encode the Newar Script in ISO/IEC 10646. February 29, 2012a. http://std.dkuug.dk/jtc1/sc2/wg2/docs/n4184.pdf. Pandey, Anshuman. Proposal to Encode the Siddham Script in ISO/IEC 10646. August 29, 2012b. http://std.dkuug.dk/jtc1/sc2/wg2/docs/n4294.pdf. Saeed, J., 2011. Semantics (Introducing Linguistics), Wiley-Blackwell, ASIN: B005UQCWQO. Sanskrit Documents, Conjungate Consonants page, at sanskritdocuments.org/learning_tutorial_wikner/P058.html. Sanskrit Heritage web site, at http://sanskrit.inria.fr/. Sanskrit Library, web site, sanskritlibrary.org. Sanskrit Studies, web site, www.sanskritstudies.org. Sanskrit Vocie, web site, sanskritvoice.com. Sanskrita.org, web site, Converter from HK to Devanāgarī and IAST http://www.sanskrita.org/wiki/index.php/Converter. SIL, ScriptSource Project, entry on Newar (Prachalit) script, http://scriptsource.org/cms/scripts/page.php?item_id=script_detail&key=Qabc. SIL, ScriptSource Project, entry on Ranjana script, http://scriptsource.org/cms/scripts/page.php?item_id=entry_detail&uid=lpplwxbtb7. Shay, Scott, 2008. The History of English: a Linguistic Introduction, Wardja Press, ISBN 978-0-6151-6817-3. Shen Fuwei, 2009. Cultural Flow between China and the Outside World throughout History, Foreign Languages Press, Beijing, ISBN 978-7-119-05753-8. Shrish Benjwal, IAST-Devanāgarī-IAST Converter, at epandit.shrish.in/tools/IAST-DV-IAST/. Schweig, G., M., 2007. Bhagavad Gita, Harper-Collins, ISBN 978-0-06-I99730-3. Thomas Malten, Sanskrit and Tamil Dictionaries, at www.sanskrit-lexicon.uni-koeln.de/scans/MWScan/tamil/index.html. Vedanta Spiritual Library, at www.celextel.org. Hindu texts in English. Unicode Consortium. Unicode 6.3.0. 2014. http://www.unicode.org/versions/Unicode6.3.0/. University College London, Educational Resources in Speech, Hearing and Phonetic Sciences, at www.phon.ucl.ac.uk/resource/educational.php. University of Texas, Ancient Sanskrit Online, www.utexas.edu/cola/centers/lrc/eieol/vedol-0-X.html. University of the West, Digital Sanskrit Buddhist Cannon, at http://www.dsbcproject.org/. Wells, J., 2010. The International Phonetic Alphabet in Unicode, University College London, at www.phon.ucl.ac.uk/home/wells/ipa-unicode.htm. Whitney, W. D., 1885. The Roots, Verb-Forms, and Primary Derivatives of the Sanskrit Language, Breitkopf and Hartel, London. Williams, P., 2009. Mahayana Buddhism: The Doctinal Foundations. 2nd Edition, Routledge, ISBN13: 978-0-415-35652-7 (hbk), ISBN13: 978-0-415-35653-4 (pbk), ISBN13: 978-0-203-42847-4 (ebk).